We continue to bargain with CPS for a new contract—with our latest bargaining session held Thursday. That session came on the heels of the strike vote announcements Wednesday of five more of the charter schools staffed by our sisters and brothers in CTU ACTS, 97% of whom turned out to vote—and 94% of whom voted to strike if there’s no meaningful progress with charter operators in the next two weeks. We’re holding hard at the table for our key positions at the bargaining table: more staffing, better pay and benefits for teachers, paraprofessionals, clinicians and support staff, and wrap-around supports for our students. We’re also on target to enter into fact-finding by May 15. Our contract expires on June 30, and we’ll bargain hard through the summer, positioning us to legally strike by the beginning of the next school year if that becomes necessary. We expect management to propose a new bargaining schedule now that there’s a new mayor, but we intend to hold tight to our signed bargaining schedule, which is consistent with state statute, or SB7. Management has, predictably, attempted today to claw back some of what we’d agreed to at the table. The boss also continues to resist our demands for open bargaining. It’s critical that we focus on bargaining hard and being strike ready this fall. That means getting our CAT teams ready in every school, saving 10% of our income each month to tide us over in the event of a strike, and reaching out to parents and neighborhood residents about what we’re demanding at the bargaining table, and why. Mayor-elect Lightfoot ran on a platform that broadly supported our bargaining positions, including more resources in neglected school communities, more staffing of critical positions, from certified school nurses to PSRPs, and a school district run on the principles of equity and fairness, rather than the insider deals, privatization scams and abuse of educators that has marked eight years of control by the outgoing mayor. We’ve reached out to the incoming mayor’s transition team to schedule a meeting with Lightfoot. However, a number of individuals appointed to her transition team do not inspire confidence. They include pension theft crusader and Republican powerbroker Ty Fahner, described as Lightfoot’s “business consigliere” by Crain’s; Penny Pritzker, a former board of education member under Rahm Emanuel; Aarti Dhupelia, an alumni of the rabidly pro-privatization Broad Center, the same outfit whose billionaire funder Eli Broad brought us the failed leadership of Jean-Claude Brizard; and Sybil Madison-Boyd, a charter school cheerleader who was formerly a key player at CICS Quest High School, which we successfully struck in February for better wages and benefits, smaller class sizes, and more classroom resources. It remains to be seen if the Lightfoot administration, particularly with these individuals serving on the transition team, will bring a more forward-thinking and progressive posture to the bargaining table. We’ll keep you posted once we’ve had an opportunity to meet with the incoming mayor and can report on whether the dynamic has shifted at the bargaining table. 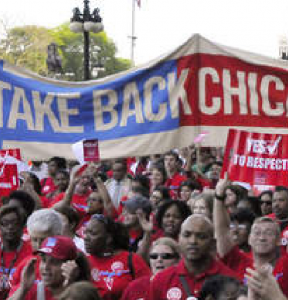 We’re also pushing Senate President John Cullerton to move bills that will restore our full bargaining rights and another that gives Chicago an elected, representative school board. The ERSB bill passed the House by a vote of 110-2 last week. Lightfoot has called the proposed board size of 21 “unwieldy.” We disagree. Chicagoans from every corner of the city deserve representation, and any smaller board could deny adequate representation for communities from the West and South Sides. Share our organizing department’s parent flyer with your students’ parents, build your CAT teams, and stay tuned. 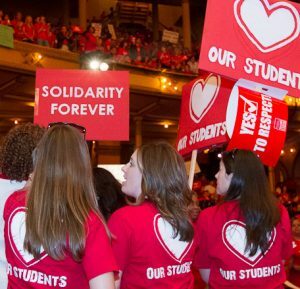 We are fighting for a better contract that transforms our working conditions, our compensation, and our students’ learning conditions—and when we fight, we win.